Bestselling poetry anthology back in print. Winner of the PEN Oakland Literary Award. Arab women poets work within one of the oldest literary traditions in the world, yet they are virtually unknown in the West. 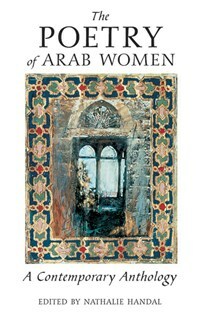 In assembling this collection, Nathalie Handal has compiled an outstanding, important treasury that introduces the poetry of Arab women living all over the world, writing in Arabic, French, English, and other languages, and including some of the twentieth century’s most accomplished poets as well as today’s most exciting new voices. Translated by distinguished translators and poets from around the world, The Poetry of Arab Women: A Contemporary Anthology showcases the work of 83 poets, among them Etel Adnan, Andrée Chedid, Salma Khadra Jayyusi, Naomi Shihab Nye, and Fadwa Tuqan. With an illuminating introduction by Handal, and extensive biographies of both poets and translators, The Poetry of Arab Women sheds brilliant light on a hitherto under-recognized group of talented poets. Hold my hand and take me to the heart for I prefer your home, oh poetry. —excerpted from Small Sins by Maram Masri (Syria) Arab women poets work within one of the oldest literary traditions in the world, yet they are virtually unknown in the West. In assembling this collection, Nathalie Handal has compiled an outstanding, important treasury that introduces the poetry of Arab women living all over the world, writing in Arabic, French, English, and other languages, and including some of the twentieth century’s most accomplished poets as well as today’s most exciting new voices. Translated by distinguished translators and poets from around the world, The Poetry of Arab Women: A Contemporary Anthology showcases the work of 82 poets, among them Etel Adnan, Andrée Chedid, Salma Khadra Jayyusi, Naomi Shihab Nye, and Fadwa Tuqan. With an illuminating introduction by Handal, and extensive biographies of both poets and translators, The Poetry of Arab Women sheds brilliant light on a hitherto under-recognized group of talented poets. Nathalie Handal divides her time between Boston, New York, and London, where she is a researcher in the English department at the University of London. She is the author of a book of poetry, The Never Field, and a poetry CD, Traveling Rooms.